The invasive wildflower Medicago polymorpha has evolved to grow more rapidly in its new range, but this change is not associated with stronger competitive ability against native plant species, according to research published by CSUN biologists in the journal Oecologia. The new paper, by Associate Professor of Biology Casey terHorst and colleagues at Cornell University and Michigan State University, reports the results of experiments comparing the performance of Medicago polymorpha plants grown from seed collected in the plant’s native range in the Mediterranean and Middle East with plants grown from seed collected in invasive populations established in sites in northern and eastern Europe, South America, Japan, and the U.S. The team found that plant lines from the invaded range grew bigger than plant lines from the native range, but when grown alongside competitors — including a grass and three different native legume species — there was no difference associated with the geographic source of the plants. 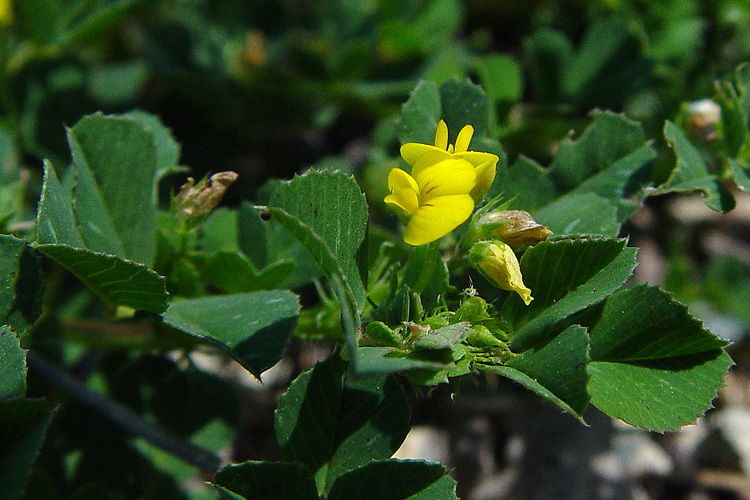 terHorst and his coauthors suggest that these results support the hypothesis that Medicago polymorpha‘s adaptation to new habitats in the places where it has invaded is driven mostly by evolution for rapid growth in open, disturbed areas where competition from native species is reduced. The full paper is available on the website of the journal Oecologia.